The newly discovered object NGC 2276-3c (shown in inset) appears to be an intermediate-mass black hole, astronomers say. A newfound cosmic object may be a long-sought missing link that could help flesh out the black hole family tree. The object appears to be an intermediate-mass black hole (IMBH), astronomers say. Called NGC-2276-3c, it lies in an arm of the spiral galaxy NGC-2276, about 100 million light-years from Earth. Researchers have long hypothesized the existence of IMBHs, which are believed to be the seeds from which supermassive black holes grow. But the midsize structures have proven elusive thus far. "Astronomers have been looking very hard for these medium-sized black holes," study co-author Tim Roberts, of the University of Durham in the United Kingdom, said in a statement. "There have been hints that they exist, but the IMBHs have been acting like a long-lost relative that isn't interested in being found." 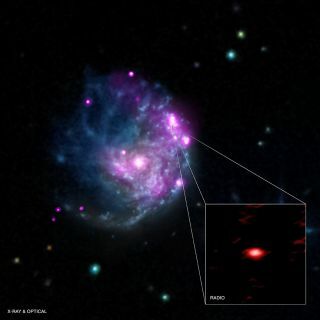 Roberts and his colleagues — led by Mar Mezcua of the Harvard-Smithsonian Center for Astrophysics in Cambridge, Massachusetts — studied NGC-2276-3c in X-ray light using NASA's Chandra X-ray Observatoryand in radio light using the European Very Long Baseline Interferometry Network. Combining these observations with the known relationship between black hole mass and luminosity in X-ray and radio wavelengths, the team calculated NGC-2276-3c's mass: the equivalanet of about 50,000 suns. "We found that NGC 2276-3c has traits similar to both stellar-mass black holes and supermassive black holes," said co-author Andrei Lobanov, of the Max Planck Institute for Radio Astronomy in Bonn, Germany. "In other words, this object helps tie the whole black hole family together." The researchers also noted that the black hole is firing off a powerful radio jet, which extends about 2,000 light-years out into space. Young stars are missing along this path for 1,000 light-years or so, suggesting that the jet has cleared out clouds of gas that otherwise would have condensed to form stars, researchers said. A separate study delves into the possible origin of the NGC 2276-3c black hole. A team of researchers led by Anna Wolter, of the National Institute for Astrophysics in Milan, Italy, used Chandra observations to determine that the equivalent of five to 15 suns are forming every year in the NGC 2276 galaxy. This high rate suggests that the galaxy recently collided with a neighboring dwarf galaxy. (Mergers generally spur star formation.) So NGC 2276-3c may actually have taken shape near the core of a dwarf galaxy, astronomers said. Both studies will be published in the journal Monthly Notices of the Royal Astronomical Society.